HI, welcome to Mechspec MG Centre. We have been providing new and used parts for any MG vehicle since 1985 and have built up a brilliant reputation both here in the UK and the USA. 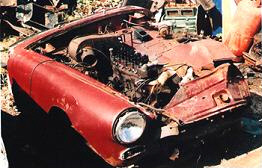 Please take the time to browse through our website of MGB, MGC, Midget and V8 components, both New and Good Used. Please e-mail us with any questions or details of your order. You may also wish to e-mail us for technical information and support. If there are specific components not listed on the website don't worry we will likely have the items in stock, its just waiting to be added to the website. If you have any questions at all we would be delighted to hear from you, we pride ourselves on offering a personal and friendly service to everyone. Around 50 per cent of business activities are involved in the sale of spares - half new, the other half used. The rest of the business is equally divided between the sale of cars and repairs. The business has been helped by Mechspec's involvement on the racing scene - in particular the BCV8 championship. Dave won the standard class in in the BCV8 Championship in 1995 and has also raced a 3.9 V8 GT in class `C. A customer of Mechspec, Andy Holmes, also raced a standard `B and won class `A in`97. Over the years Mechspec have met some interesting customers. Heritage bought some otherwise unobtainable front suspension cross members from them when they were developing the RV8. Some customers have been particularly specific, as Dave recalls, "We had a chap who was doing a concours Midget and he wanted a pair of second hand drop glasses. The reason he wanted second hand was because he wanted to get the exact kite mark in the top corner of the window that was applicable to that year of car. We went through 50 Midgets and eventually sorted him out. Few people realise, or would even notice that very early MGBs have a different pattern on the side lamp lens that later ones. We had a chap building an early concours MGB. He wanted the exact original lenses and after much searching round we fixed him up!" Mechspec customers are far and wide around the world, especially since the advent of the Internet. And they have also been around the world themselves looking for parts, particularly sourced from the USA. "I'd heard that people were buying cars from America and in 1990 I put a little advert in a magazine basically stating that we were coming to America and had anybody got any parts or cars for sale. A chap called Harry Dove phoned us who, at the time, was 60 years old. I went to Savannah, Georgia, to meet Harry as he was interested in getting into exporting. "We brought four cars whilst we were there and within a very short space of time Harry was going out looking round junkyards for us. 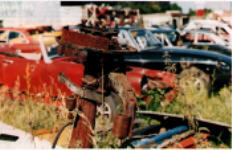 At a lot of the junkyards we found that people were actually crushing cars. The MG parts market in America was shrinking, mainly I think because of the expense of getting them fixed over there, and the influx of newer Japanese models. They were squashing virtually perfect MGs." With Harry's help, Dave and two of his men soon found themselves taking around 50 MGs to pieces in the baking Florida sun and packing the whole lot into a 40-foot container. Dave admits it was very hard going, but had the added bonus of an hour in the hotel pool after work. A tough job but somebody's got to do it! To date Mech Spec have received 12 shipments from the USA, have dealt with eight scrap yards and brought back parts from around 2,000 MGs. "In 1994 we got quite lucky," says Dave. "Harry found this chap who had some second hand spares and a few new spares. We'd just finished doing another job and we went over to see him - he was in North Carolina. When we got there we couldn't believe it. He'd got a few bits of second hand stuff and racks and racks of new parts. If had actually come from the factory when it closed down. He was a big distributor in America of new and used spares and had been lucky enough to buy all this stock from the Abingdon factory when it shut. It was just sat there in this warehouse, miles from anywhere. I couldn't believe it." Unfortunately Dave didn't have enough money to buy it all. The owner had it all documented and he reckoned there was a million dollars in new stock, but realised that it wasn't worth that much - plus a lot of the stock was bin fodder. He wanted $200,000 for it all. Dave couldn't afford it, but offered $100,000 and it was accepted. The day the deal was done was the one day when the exchange rate hit to $2 to the pound, so Dave only spent £50,000. Wiseton, Nr Doncaster based Mechspec MG Centre claim to be the biggest in the industry when it comes to second hand spares for `Bs and Midgets. Take a look in their back yard and you can see their point. Although the business stocks a mere 70 `scrappers' - 50 for parts, 20 which will be sold as resto projects or rebuilt - there's a mountain of neatly stacked doors, bonnets and all the essential bits you need. Order and tidiness usually prevail, however Mechspec boss Dave Parker confessed to recently finding a set of MGC front hubs buried in the mud courtesy of a fork lift truck - the hubs were fine and made one customer very happy. Mechspec started trading back in 1985. "I was working for a company which supplied engine parts", says Dave, "and I noticed nobody was advertising reconditioned `B engines. I thought with my access to the parts and machining I could do this at home." "I put an ad in the Owners' Club mag and it wasn't long before I was doing two or three engines a week from home and using my company car to deliver them at weekends. I was working until one or two o'clock in the morning building engines in the garage - the job I had was a rep job, it wasn't well paid and I found I was making more money doing the engines. I didn't particularly like working for someone else. Eventually I thought if I could earn the £100 a week I was earning at work, then I might as well have a go on my own." Dave took the plunge and rented himself a forty-quid-a-week unit in Worksop. "I had £500 worth of stock and one 16-year-old YTS lad helping out. We started doing basically what I'd done at home and just selling a few spares as well." The second hand spares side of Mechspec Spec through buying and breaking MGs emerged by accident some years before. 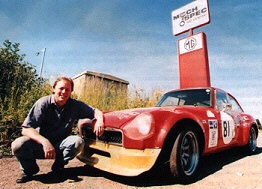 "I'd brought a damaged MGB GT V8 for £350 from Chesterfield," recalls Dave. "I looked at it and there was no way it was going to be properly repaired without a re-shell. So I rang an MG specialist down south and he said that he had a used GT shell in shock. "Armed with my limited knowledge at that time I went down and collected it, then stripped it all, only to find it was the wrong shell. They'd sold me a three-synchro shell from a Sixties car. I was totally stumped. I'd spent all my money. The only thing I could do was break the V8 to get some money back. I broke the V8 and got five times back what I'd paid for it!" Dave started to get known for breaking MGs and soon got offers to buy scrap cars. Many parts were not being remanufactured then as they are now, so for many components second-hand was the only answer. By 1989 Dave was ready to move into new premises. He again took the plunge and went for his Sandy Lane location which at the time was far too big for what he needed. "Everybody said that we were mad when we moved up here," says Dave. "We'd moved from a fairly small unit to quite a big unit. All the stock we had just rattled round. We had a tiny office and we were just lost in what seemed to be a huge place." Over the years the business gradually built up, and the premises and workshop bulged at the seams. In late 1999 Dave and his wife Christine had an idea that they would actually like to move out of Worksop and buy a home in the countryside for themselves and their 4 cats. Dave says "We had looked at few places and eventually, by accident, we came across Prospect Hill Farm. The place had a good sized house and loads of barns, and a huge workshop. We both took one look at the place and said - Perfect! Protracted price negotiations took place and after selling our house, the business premises and our MGA, and just about everything we owned, we moved lock, stock and barrel in April 2000. We've never looked back, the place is ideal for us, and despite taking 7 weeks to move everything it's all worked out great" Most of Mechspec's Worksop customers have followed them to their new location and new customers from the local area and further East are helping to build the re-located business. At present the business is run by Dave with the help of Christine who runs the office and deals with all the internet customers and shipping. Mechspec's main mechanic is Steve who has been with Dave for 15 years and knows MG's inside out. They have an apprentice on the mechanical side and now full body and paint-work facilities run by colleagues Russ and Bill. With the stream of current sports cars on the market, does Mechspec envisage dealing in second hand and scrap MGFs in the future? "I know people have started to break the MX5 and crashed MGFs," says Dave. "However, the European Parliament are introducing more laws all the time which are making it harder and harder to deal in used parts. I've heard that the latest crazy proposals involve classifying all cars which are unroadworthy - including cars being restored - as waste, with the local council having the power to tow them away. If proposals like this become law, what will this mean for the home restorer, and is anyone doing anything about it?" In the meantime however, Mechspec continue to keep the `Bs and Midgets of the world alive with a yard full of cars to choose from.